by Chris Woodford. Last updated: June 17, 2018. Nothing is completely secure. Locks can be picked, safes can be broken into, and online passwords can be guessed sooner or later. How, then, can we protect the things that we value? One way is to use biometrics—fingerprints, iris scans, retinal scans, face scans, and other personal information that is more difficult to forge. Not so long ago, if you'd had your fingerprints taken, chances are you were being accused of a crime; now, it's innocent people who are turning to fingerprints to protect themselves. And you can find fingerprint scanners on everything from high-security buildings to ATM machines and even laptop computers. Let's take a closer look at how they work! 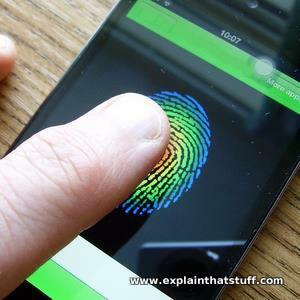 Photo: Taking a thumbprint with a handheld fingerprint scanner. The scanning area is on top of the machine (on the left as we look at it) and you can see the image of the print appearing on the LCD screen. Photo by TSgt. Efren Lopez courtesy of US Army. Photo: Your fingerprints are like unique keys you carry everywhere. In theory, no-one else has the same prints as you. The word "fingerprint" is a bit misleading: these ridges on the ends of your fingers and toes aren't there to help people identify you, but to give you better grip on things you pick up or walk on. It's pretty obvious why we have fingerprints—the tiny friction ridges on the ends of our fingers and thumbs make it easier to grip things. By making our fingers rougher, these ridges increase the force of friction between our hands and the objects we hold, making it harder to drop things. You have fingerprints even before you're born. 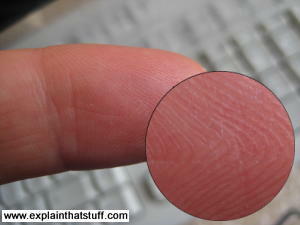 In fact, fingerprints are completely formed by the time you're seven months old in the womb. Unless you have accidents with your hands, your fingerprints remain the same throughout your life. What makes fingerprints such a brilliant way of telling people apart is that they are virtually unique: fingerprints develop through an essentially random process according to the code in your DNA (the genetic recipe that tells your body how to develop). Because the environment in the womb also has an effect, even the prints of identical twins are slightly different. While it's possible that two people could be found who had identical fingerprints, the chances of this happening are so small as to be virtually negligible. In a criminal case, there are usually other pieces of forensic evidence that can be used with fingerprints to prove a person's guilt or innocence beyond reasonable doubt. Where fingerprints are being used to control access to something like a computer system, the chances of a random person having just the right fingerprint to gain entry are, generally speaking, too small to worry about—and much less the chance of someone guessing the right password or being able to break through a physical lock. Suppose you're in charge of security for a large bank and you want to put a fingerprint scanning system on the main entry turnstile where your employees come in each morning. How exactly would it work? There are two separate stages involved in using a system like this. First you have to go through a process called enrollment, where the system learns about all the people it will have to recognize each day. During enrollment, each person's fingerprints are scanned, analyzed, and then stored in a coded form on a secure database. Typically it takes less than a half second to store a person's prints and the system works for over 99 percent of typical users (the failure rate is higher for manual workers than for office workers). Once enrollment is complete, the system is ready to use—and this is the second stage, known as verification. Anyone who wants to gain access has to put their finger on a scanner. The scanner takes their fingerprint, checks it against all the prints in the database stored during enrollment, and decides whether the person is entitled to gain access or not. Sophisticated fingerprint systems can verify and match up to 40,000 prints per second! 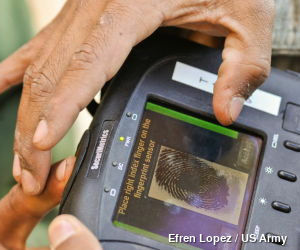 Photo: Fingerprints are best known for helping in criminal investigations. Photo by Sgt. Jess Kent courtesy of US Army. When fingerprints were first used systematically for criminal investigation in 1900, by Sir Edward Henry of the Metropolitan Police in London, England, they were compared slowly and laboriously by hand. You took a fingerprint from a crime scene and another fingerprint from your suspect and simply compared them under a magnifying glass or microscope. Unfortunately, fingerprints taken under different conditions can often look quite different—the one from the crime scene is much more likely to be incomplete or smudged—and comparing them to prove that they are identical (or different) sometimes takes great skill. That's why forensic scientists (people who study evidence collected from crime scenes) developed a reliable system for matching fingerprints where they looked for between eight and sixteen distinct features. In the UK, two fingerprints need to match in all sixteen respects for the prints to be judged the same; in the United States, only eight features need to match. Photo: A computer can compare fingerprints by identifying key features, then measuring the distances and angles between them. Algorithms can turn patterns like this into unique numeric codes. When a computer checks your fingerprints, there obviously isn't a little person with a magnifying glass sitting inside, comparing your fingerprints with all the hundreds or thousands stored in the database! So how can a computer compare prints? During enrollment or verification, each print is analyzed for very specific features called minutiae, where the lines in your fingerprint terminate or split in two. The computer measures the distances and angles between these features—a bit like drawing lines between them—and then uses an algorithm (mathematical process) to turn this information into a unique numeric code. Comparing fingerprints is then simply a matter of comparing their unique codes. If the codes match, the prints match, and the person gains access. Having your fingerprints taken at a police station involves pressing your fingers onto an ink pad and then rolling your fingers onto paper to leave a clean impression on the page. Your prints are also stored on a computer database so the police can check if you've committed any known crimes or if you do so in future. But when fingerprints are being used to control access to buildings and computer systems, more sophisticated methods have to be used: a computer has to scan the surface of your finger very quickly and then turn the scanned representation into a code it can check against its database. How does this happen? Photo: A typical optical fingerprint scanner—it's a bit like photocopying your hand or placing it on a computer scanner. Photo by Tech. Sgt. Francisco V. Govea II courtesy of US Army. There are two main ways of scanning fingers. An optical scanner works by shining a bright light over your fingerprint and taking what is effectively a digital photograph. If you've ever photocopied your hand, you'll know exactly how this works. Instead of producing a dirty black photocopy, the image feeds into a computer scanner. The scanner uses a light-sensitive microchip (either a CCD, charge-coupled device, or a CMOS image sensor) to produce a digital image. The computer analyzes the image automatically, selecting just the fingerprint, and then uses sophisticated pattern-matching software to turn it into a code. Another type of scanner, known as a capacitive scanner, measures your finger electrically. When your finger rests on a surface, the ridges in your fingerprints touch the surface while the hollows between the ridges stand slightly clear of it. In other words, there are varying distances between each part of your finger and the surface below. 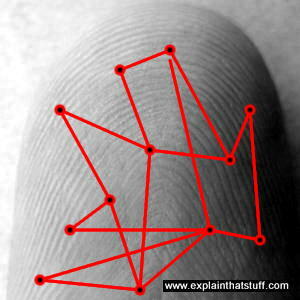 A capacitive scanner builds up a picture of your fingerprint by measuring these distances. Scanners like this are a bit like the touchscreens on things like iPhones and iPads. Unlike ordinary digital photos, scans have to capture exactly the right amount of detail—brightness and contrast—so that the individual ridges and other details in the fingerprint can be accurately matched to scans taken previously. Remember that fingerprints might be used as evidence in criminal trials, where a conviction could result in a long jail sentence or even the death penalty. That's why "quality control" is such an important part of the fingerprint scanning process. Photo: Quality counts: fingerprint scans have to produce images with enough detail to allow an accurate comparison with other scanned images. A row of LEDs scans bright light onto the glass (or plastic) surface on which your finger is pressing (sometimes called the platen). The quality of the image will vary according to how you're pressing, how clean or greasy your fingers are, how clean the scanning surface is, the light level in the room, and so on. Reflected light bounces back from your finger, through the glass, onto a CCD or CMOS image sensor. The longer this image-capture process takes, the brighter the image formed on the image sensor. If the image is too bright, areas of the fingerprint (including important details) may be washed out completely—like an indoor digital photo where the flash is too close or too bright. If it's too dark, the whole image will look black and details will be invisible for the opposite reason. An algorithm tests whether the image is too light or too dark; if so, an audible beep or LED indicator alerts the operator and we go back to step 1 to try again. If the image is roughly acceptable, another algorithm tests the level of detail, typically by counting the number of ridges and making sure there are alternate light and dark areas (as you'd expect to find in a decent fingerprint image). If the image fails this test, we go back to step 1 and try again. Providing the image passes these two tests, the scanner signals that the image is OK to the operator (again, either by beeping or with a different LED indicator). The image is stored as an acceptable scan in flash memory, ready to be transmitted (by USB cable, wireless, Bluetooth, or some similar method) to a "host" computer where it can be processed further. Typically, images captured this way are 512×512 pixels (the dimensions used by the FBI), and the standard image is 2.5cm (1 inch) square, 500 dots per inch, and 256 shades of gray. The host computer can either store the image on a database (temporarily or indefinitely) or automatically compare it against one or many other fingerprints to find a match. What can you use fingerprint scanning for? 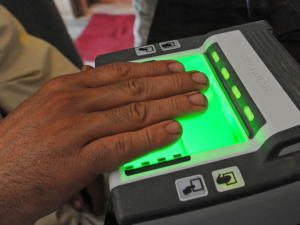 Photo: Biometrics isn't necessarily sinister. 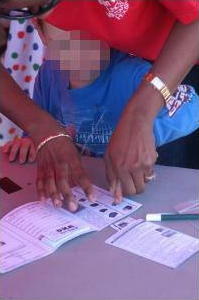 Here, a child's fingerprints are being taken to help with identification after a humanitarian disaster. Photo by Porter Anderson courtesy of US Navy. Fingerprint scanning is the most popular biometric technology (used in over half of all biometric security systems)—and it's easy to see why. We store more and more information on our computers and share it, online, in ever more risky ways. Much of the time, our bank information and personal details are protected by just the few hastily thought-out numbers in our passwords. Anyone can use your credit or debit card to get money from an ATM (automated teller machine or "cashpoint") if they know just four numbers! In future, it will be much more common to have to confirm your identity with biometric information: either your fingerprint, a scan of the iris or retina in your eye, or a scan of your face. Some laptop computers and cellphones now use fingerprint scanning to make them more secure. Large banks, such as Bank of America and JPMorgan Chase, have introduced fingerprint authentication as part of the signin process for their smartphone apps. Soon we could be seeing fingerprint scanners on ATMs, in airport security scanners, on checkouts in grocery stores, in electronic voting systems, and perhaps even replacing the keys in our (self-driving) automobiles! Some people don't like the sound of a "Big Brother" society where you have to do everything with your fingerprints—and it's true that there are important issues of privacy. But humans have always used biometrics for personal identification: we tell one another apart chiefly by recognizing one another's faces and voices. Worry about the drawbacks, by all means, but don't forget the advantages too: your information should be much more secure from criminals—and you'll never again have the problem of losing your keys or forgetting your password! Touchless Fingerprint Biometrics by Ruggero Donida Labati, Vincenzo Piuri, Fabio Scotti. CRC Press, 2015. The Fingerprint Sourcebook by US Department of Justice. CreateSpace, 2014. Handbook of Fingerprint Recognition by Davide Maltoni, Dario Maio, Anil K. Jain, Salil Prabhakar. Springer, 2009. Automated Fingerprint Identification Systems (AFIS) by Peter Komarinski. Academic Press, 2005. Automatic Fingerprint Recognition Systems by Nalini Kanta Ratha and Ruud Bolle. Springer, 2004. Biometrics For Dummies by Peter Gregory and Michael Simon. Dummies, 2008. Biometrics: Identity Assurance in the Information Age by John D. Woodward, Nicholas M. Orlans, and Peter T. Higgins. McGraw Hill, 2003. That Fingerprint Sensor on Your Phone Is Not as Safe as You Think by Vindu Goel. The New York Times. April 10, 2017. Computer science researchers claim fingerprint detectors on smartphones are too easy to crack. Goodbye, Password. Banks Opt to Scan Fingers and Faces Instead by Michael Corkery. The New York Times. June 21, 2016. Why online apps are switching to fingerprints and face recognition. Bank customers to sign in with 'finger vein' technology by Simon Gompertz, BBC News, 5 September 2014. An alternative method of finger-based biometrics works by scanning the unique pattern of veins in your fingers. Print 3D Fingerprints for Better Biometrics by Eliza Strickland. IEEE Spectrum, March 6, 2014. How do you do realistic tests of fingerprint systems? By 3D printing your own test fingers! Ears Could Make Better Unique IDs Than Fingerprints by Dave Mosher, Wired, 12 November 2010. Why ear identification may be a more reliable form of biometrics than fingerprinting. Fingerprints and other biometrics: This FBI page points to a variety of useful documents, including guides on how to take fingerprints, the US standard fingerprint form, and details of next-generation biometric systems, such as Advanced Fingerprint Identification Technology (AFIT). US Patent 6,983,062: Fingerprint scanner auto-capture system and method by David C. Smith, Cross Match Technologies, Inc. Issued January 3, 2006. US Patent 6,744,910: Hand-held fingerprint scanner with on-board image normalization data storage by George William McClurg et al, Cross Match Technologies, Inc. Issued June 1, 2004. Describes a modern, compact, hand-held scanner. US Patent 3,527,535: Fingerprint observation and recording apparatus by John N. Monroe, EG & G, Inc. Issued September 8, 1970. A much older apparatus based on an entirely optical method of scanning and photographing fingerprints.